When you're building supertalls, there are other problems to worry about than just making sure they don't fall or blow over. One of the biggest is how to get people up to the top in a reasonable amount of time. If you've got a slow elevator the 125th floor might as well not exist. 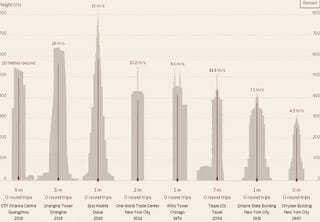 This graphic, put together by the Financial Times, shows how some of the world's tallest towers' elevators compare, and it's not as simple as "taller = faster." The Burj Kahalifa, tallest tower in the world, has one of the slowest elevators (a mere 10m/s) compared to other towers that are in its general ballpark. 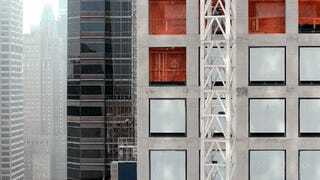 And the CTF Financial Centre skyscraper—due to be completed in 2016—will have the fastest at a blazing 20 m/s. These impressive people movers aren't just something you can whip out of nowhere though, and to make sure they can handle the incredible heights and reasonable speeds, they have to undergo a ton of testing in an abandoned mineshaft.